After our trip, we were all out of whack with sleep and time, and although we were tired, we got up early on our first morning back and went for a drive in search of food. 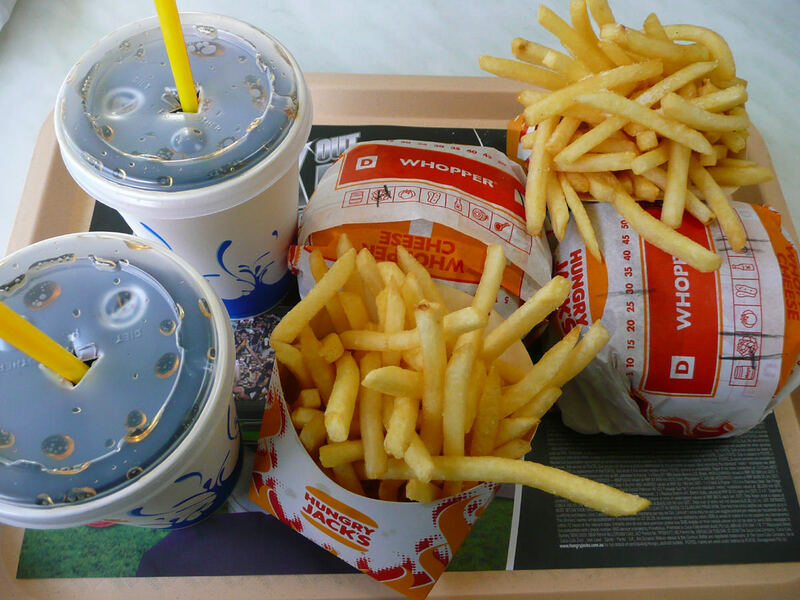 I love sitting in a booth at Hungry Jacks and having burgers and fries with my sweetheart. It’s a simple pleasure. Jac ordered an Ultimate Double Whopper meal (the burger, fries and a drink). 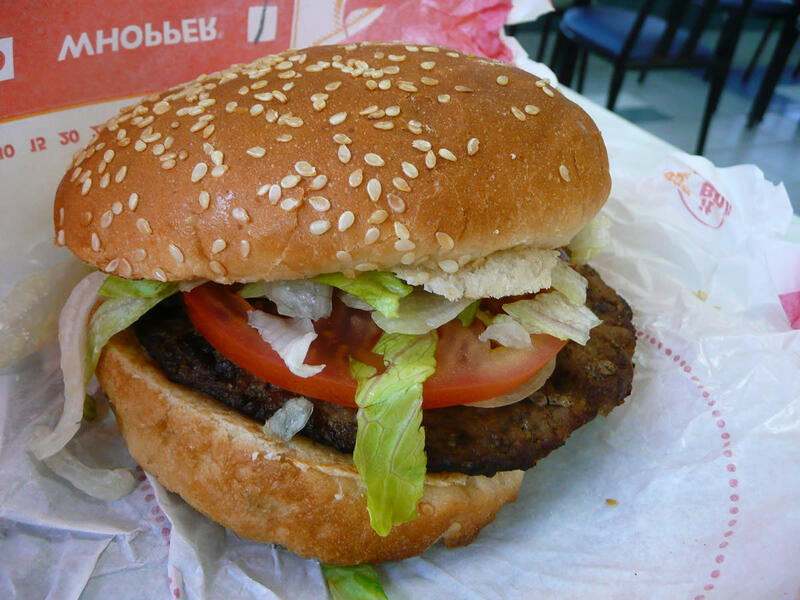 When ordering, Jac read off the menu and asked for an “Ultimate DBL Whopper with heavy lettuce and onion”, saying “DBL” as the letters D-B-L. After we’d ordered, I whispered to her, “Sweetie, ‘DBL’ stands for “double” – they’ve just shortened it on the menu so the name of the burger will fit on one line.” Her response was: “Oh, I didn’t think of that.” Heheheh. She makes me laugh (not unkindly, I assure you!). 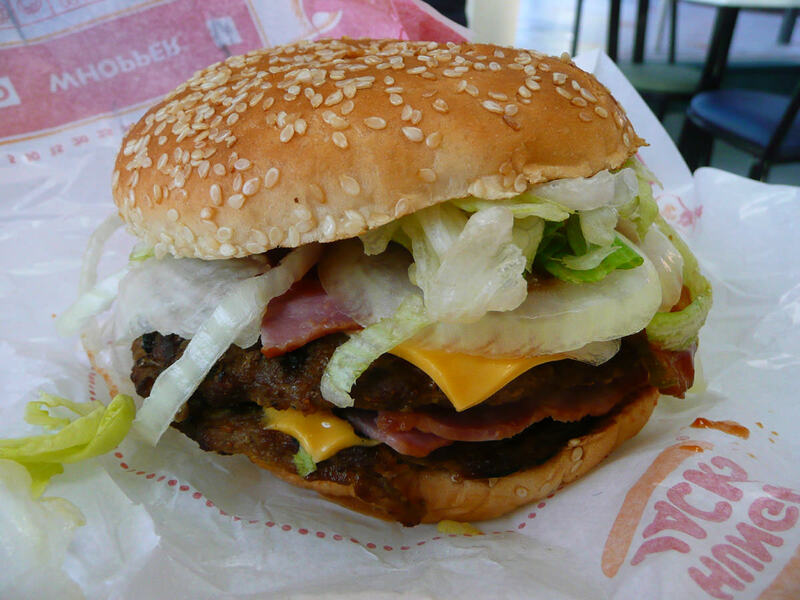 :) The D-B-L Whopper looked pretty good, all meaty and bacony and bursting with that extra lettuce and onion. Raw onions – yes or no? I think the only time I actually eat raw onion is in Whoppers. Other than that, I tend to pick out the raw onion from my salads. When I was 11 or 12 years old, this guy in my class liked to eat sandwiches filled with sliced raw green capsicum and raw onions. He was the same guy who told me he tried eating cat biscuits once – and liked them. :) Do you guys like eating raw onion, or are you like me, and only tolerate it / like it in certain dishes?